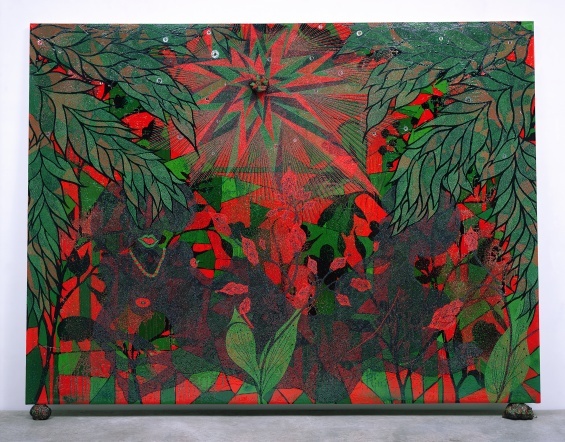 Join us for a family workshop offered in conjunction with the exhibition “Chris Ofili: Night and Day,” the first American survey of work by the acclaimed British artist. From 10 a.m. to 12 p.m., travel to tropical Trinidad to explore colorful natural environments that have inspired the artist’s work. Participants will paint the colors of the night sky and observe the world with fresh eyes by creating their own kaleidoscopes. New Museum First Saturdays for Families are free of charge. This program is designed and recommended for families with children aged between four and twelve years, and includes free New Museum admission for up to two adults per family. Children under eighteen are always admitted free. No preregistration is required. Space is limited and tickets are given out on a first-come, first-served basis. Your entire party must be present; tickets will not be given to partial parties. Special thanks to David Zwirner and Victoria Miro, London.